I am really excited to be reviewing these products as I was very fortunate to receive some goodies from The Hut Group. Now The Hut Group if you aren’t aware own Man Kind, Beauty Expert, HQ Hair, Look Fantastic and many more amazing sites. I am very familiar with Man Kind and Beauty Expert and they are great for getting the right price for your desired beauty product. Now lets get to the exciting bit! Men Rock are a brand I’ve never tried out before, but after suffering from a bad shaving rash for the last few months, receiving these products made me even more excited! And wow did they work. The first of the two beard related products was the Men Rock Soothing Beard Balm. The balm is very light weight and non greasy, that sinks well into the skin. Now I don’t have a beard but Id like to say I have long stubble and even that causes irritation when maintaining. I wasn’t sure how these products would work with my amount of facial hair and I was scared it would just give me a really greasy neck, but the results were quite the opposite. The balm really soothed the rash taking away almost all of the redness and that was only after 2 days of using it! The bottle is also really nice with a well designed smooth pump to release the lotion. “Apply a small amount of balm to a towel-dried beard after a bath or shower. Massage well into beard and the skin below. Look at yourself in the mirror – and wink!” This really did make me giggle reading this. The next beard related product was the Man Kind Beard Conditioning Oil. Now this worked perfectly with the Soothing Balm! A few drops of this patted into the skin really did do the finishing touch and can I say, it smells amazing! The whole process softens the rough stubble and takes away and dry patches and redness caused by shaving irritation. This two step beard care really is worth it and has immediate results! I can only imagine having a very long beard and how rewarding it would feel applying these products making the most of it! But as mentioned before, it has worked wonders for my facial hair. Highly recommended for any men out there who want to take that extra bit of care with their facial hair! Another great thing is.. these are suitable for ALL skin types! Check out the other Men Rock products here. These products would also be a great gift for your man, I’m talking to you ladies out there! 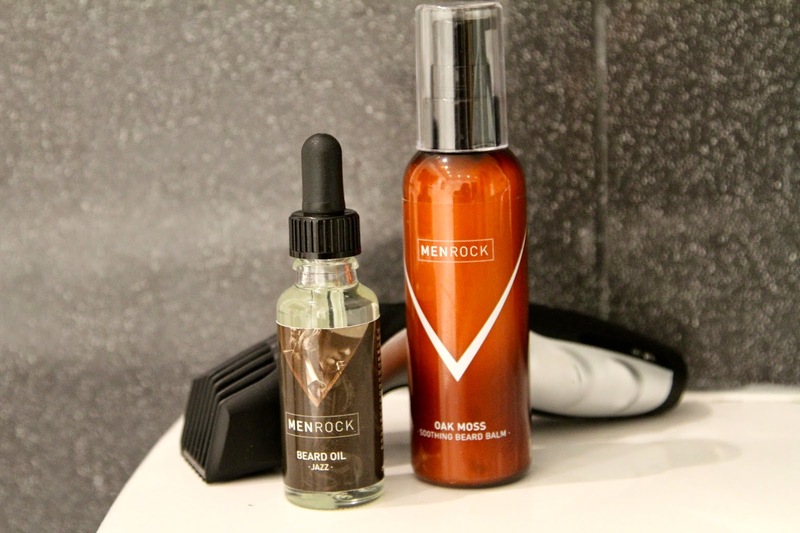 Let me know what you think about Men Rock, and do you have any facial hair grooming secrets?